Gimme some failure – part 2 | Be Nice. I was good at school. I’ve said that before and thought it was true. I typically said this in response to someone who didn’t test well in college or high school. I would reply with something blah blah blah and somewhere in there I would throw, “I was good at school.” As if it was a “talent.” As if it were a game. Thinking back on it, I think it was. For me. The things I was most afraid of doing badly (because they meant the most to me) – those were the things for which I would lower the bar. In undergrad I would start the semester off with less effort so that by the end of the course I was giving 100% of my effort and seeming like I had learned a lot. And I would get the A, thinking to myself, “Hey, I must be really good.” But I didn’t feel good. I didn’t earn my confidence in that field. I was just good at getting the grade. Don’t get me wrong, it mattered to me that I did well. And a lot of the time I worked my tail off (like a ten page paper for my art history class that used thirty sources), but some of the time I didn’t. Deep inside I knew I was afraid of failing, and so I took the safe route (the lazy route). What would it say about me if I wasn’t good at my art all the time? I perceived mistakes and stumbling blocks as utter failure from which there was little recovery. It was devastating when I made mistakes. And this fear of error-making and disappointment in my lack of courage cycled around to whittle away further my self-confidence – making getting a good grade seem superficially all the more important. I knew my fears were doing a disservice to my education, but those fears still held me back. What was I really learning? How was I growing? I hadn’t gained confidence in art making the way I gained it in other subjects. I didn’t challenge myself the way I did in my logic class, where I studied hours and hours on end to get the “A” on my tests. I earned that “A.” I knew I could do the job, earn the grade, and walk away from the class feeling good and never looking back. But with art? Well, that was my major. That was going to be my life. I had gone “all in” when I chose art and I didn’t want to lose. So I got through undergrad. And I learned a lot. But not as much as I would have learned if I had mastered the true art of falling on my face. 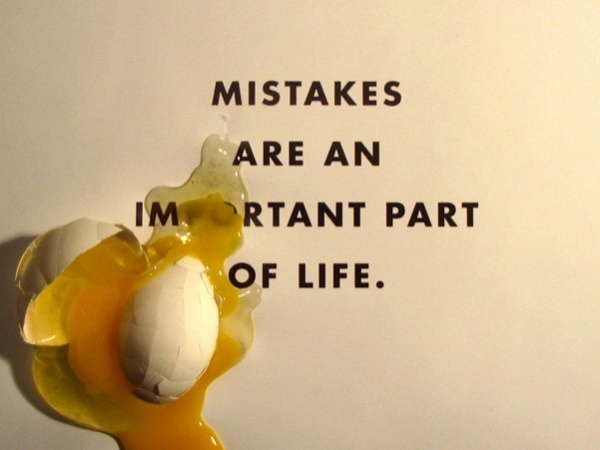 Of making mistakes and trying again. Of working hard and persevering. Sure I had persevered with so many other things – family relationships, personal development… but the art? Not so much. Luckily I smartened up by graduate school, when I knew it was time to fish or cut bait. Wired magazine blog “The Frontal Cortex” by Jonah Lehrer recently featured an article – “Why Do Some People Learn Faster?” The article summarizes two kinds of thinkers: fixed mindset (“this is what I have got and I can’t change it”) or growth mindset (“I can work hard and do better at this and that and that and….”). I think now, having fully devoted myself to my education the last five years that I am slowly eeking over to the “growth mindset” side of things. And that is pretty exciting! I know now that the things which matter are usually the ones that scare me, make me uncomfortable, or make me angry when people call me out on them. So needless to say these days, those are the things I am focusing on. If it scares me, I should probably do it. Growth. Definitely my new mindset. I urge you to check out this wonderful article by Jonah Lehrer. What kind of learners are you raising in your family? What kind of learner are you? What were you growing up? How do you respond to failure? I find the topic pretty interesting. Hopefully you will too. This is worth the look! This entry was posted in Perspectives on Be Nice. and tagged education, failure, Jonah Lehrer, personal development by Jen. Bookmark the permalink.